This past Saturday a number of members of the Pasadena Baha’i community and their friends came out in the rain to serve the community at the 28th Annual Black History Parade and the Pasadena Marathon Health & Fitness Expo. Each year, Pasadena Baha’is support the Annual Black History and Parade with volunteers. Marching in the Parade were students from Pasadena City College Ujima Program, headed up by PCC counselor and community member Chiara Thomas. 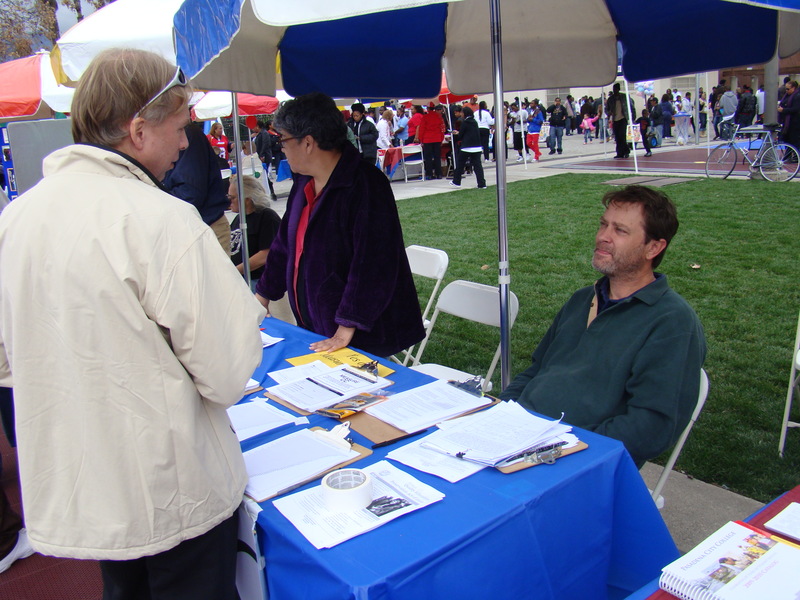 Also supporting at the Fair, held at Jackie Robinson Park, was community member Scott Phelps, VP of the Pasadena Unified School District Board of Education. He was promoting the passing of the parcel tax to increase financial support for Pasadena Public Schools in the wake of an impending budget gap facing school districts statewide. 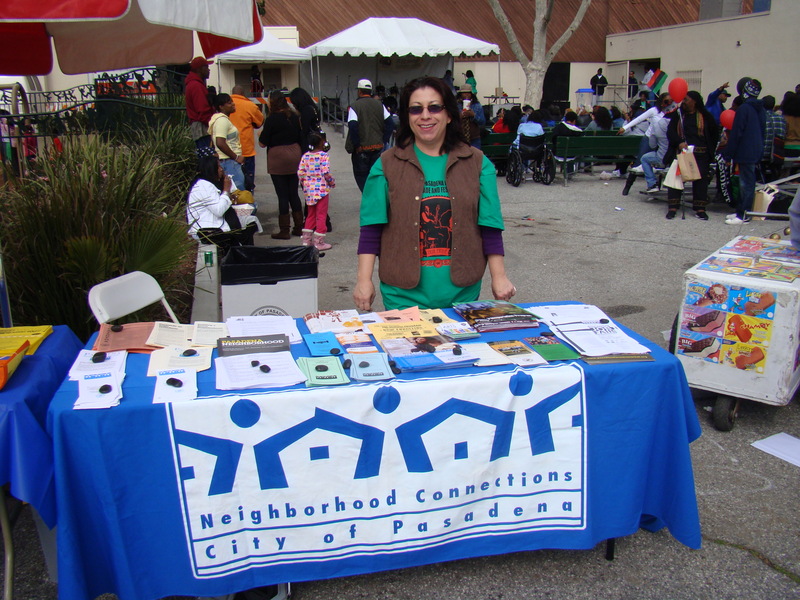 Also representing at the Fair was the City of Pasadena’s Neighborhood Connections department, whose booth was staffed by this blog’s dear friend and community dynamo, Tania Flores. 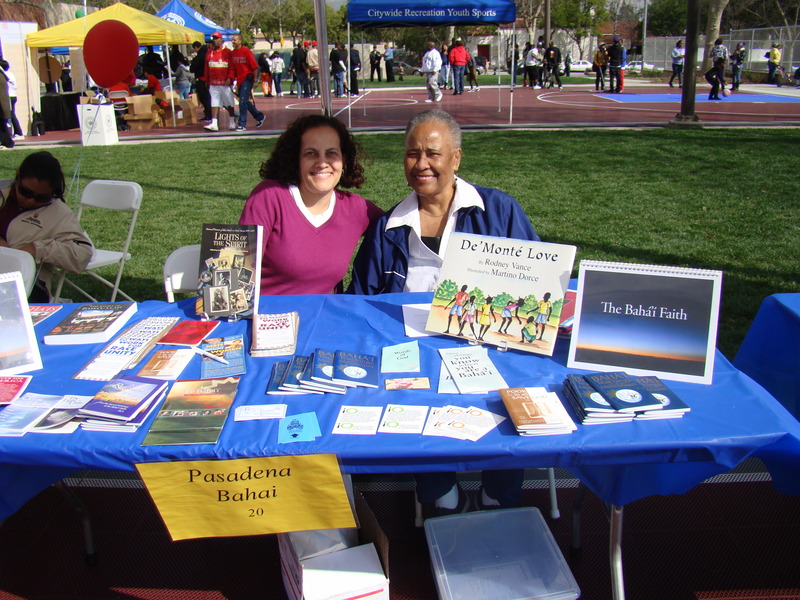 She was passing out information and promoting the Pasadena Neighborhood Leadership Institute, of which two of the Pasadena Baha’i community members are graduates, Dorothea Bradley in 2007, and Al Cadena in 2009. The Baha’is were also there at the Fair. Despite the rain, many people came up to our table, asking profound questions and wanting to know the Baha’is relationship with Jesus (he is the Son of God), where the Faith was founded (Iran), where is its world center (Haifa, Israel), key principles like the equality of women and men, abolition of all forms of prejudice, and the unique role and contributions that African Americans have made to the Baha’i Faith over the years. Seen at the Pasadena Baha’i booth were Bill DeTally and Esther Bradley-DeTally, stalwart volunteers in the community in regards to Race Unity, America’s most vital and challenging issue. Both have volunteered extensively with the San Gabriel Valley Interfaith Council and the YWCA’s Racial Justice Committee. Esther teaches a writing workshop, “Courage to Write,” at La Pintoresca library, located in Northwest Pasadena, and whose workshop will be featured at the All Saints Women’s Community’s Lunch of Compassion, on Sunday, March 7th, 2010. Also representing at the booth were Renee Dixon, longtime volunteer for the Black History Parade and member of the Altadena Interfaith Group, and Mattie McCrae, newest member of our community. 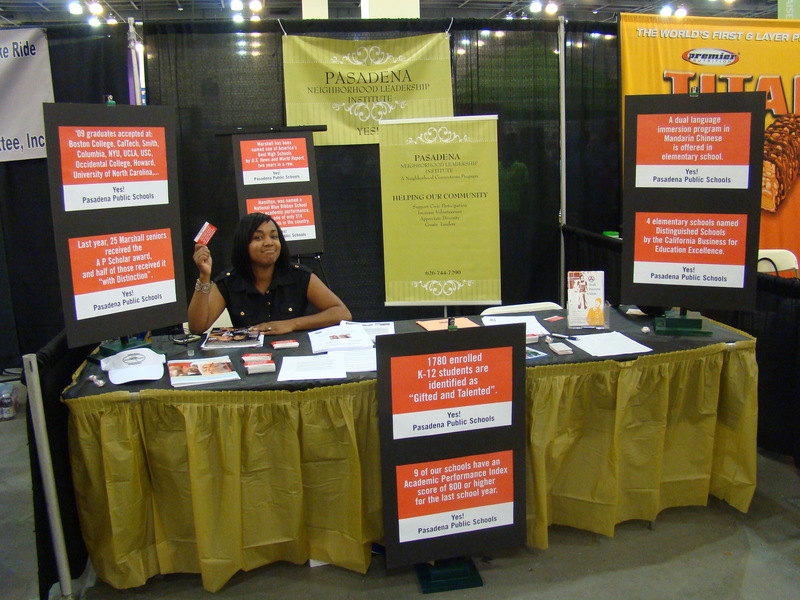 Later that afternoon at the Pasadena Convention Center, the Pasadena Neighborhood Leadership Institute (PNLI) Class had a booth to promote their class project: how to improve the community perception of Pasadena Public Schools, especially in light of all the recent improvement in test scores and other statistics.